Think you've seen it all in Vegas? Think again! Think you've seen it all in Vegas? Sure, you've strolled down the Strip and seen the fountains at the Ballagio, but have you been swimming with sharks at Mandalay Bay? Thought not. Read on for our Top 10 unique experiences in Las Vegas! Take a guided tour through the place where neon signs go to die: the Neon Museum. Home to some of the most treasured and world-famous signs of Las Vegas, the Neon Boneyard also serves as inspiration to fascinated artists, historians and designers. The museum is a popular place for photo ops, as well as weddings. This exhibition offers an incredible insight into the systems of the human body. An innovate preservation process allows you to view 200 human specimens, dissected and tastefully displayed. While this may sound somewhat grisly, Bodies is a highly educational and fascinating experience that can be uniquely yours in Las Vegas. Las Vegas has gone to Hell at this interactive R-rated haunted attraction. Truly a unique experience, the cast of actors will have you screaming for mercy as you witness your own death, attend a terrifying circus of horrors, and enter Castle Vampyre. This isn't your standard Halloween act, so don't bring the kids! A personal favourite, the Mob Museum delves into the murky world of gangland crime, showcasing both sides of the battle between the Mafia and law enforcement. Learn about notorious criminals such as Al Capone, Lucky Luciano and John Gotti. Don't adjust your screens, you read the right! I'll take my burger with a side of marriage, please. You can now say your vows at Denny's and cut into a wedding cake made from Pancake Puppies - a calorific way to start off married life! To mark the occasion, you can get your wedding photo taken in the interactive photo booth, complete with Vegas related props, and have the results posted straight to Facebook or Twitter. Fancy yourself as a bit of a speed demon? At the Las Vegas Motor Speedway you can put your money where your mouth is and get behind the wheel of a Ferrari race car, as well as some of the fastest exotic cars on the market. Feel the thrill of a 600 hp NASCAR race car during a high-speed ride along! Take playing in the sand box to a whole new level! Choose your weapon - bulldozer or excavator - and start smashing, grabbing and DIGGING MASSIVE HOLES! Sample exercises with a bulldozer include building huge mounds, pushing gigantic tires, and teetering over a mega mound. If excavation is more your thing, dig a gigantic trench, stack 2,000 tires and play "Bucket Basketball". Hours of fun can be had in this heavy equipment playground - just remember to play nice! 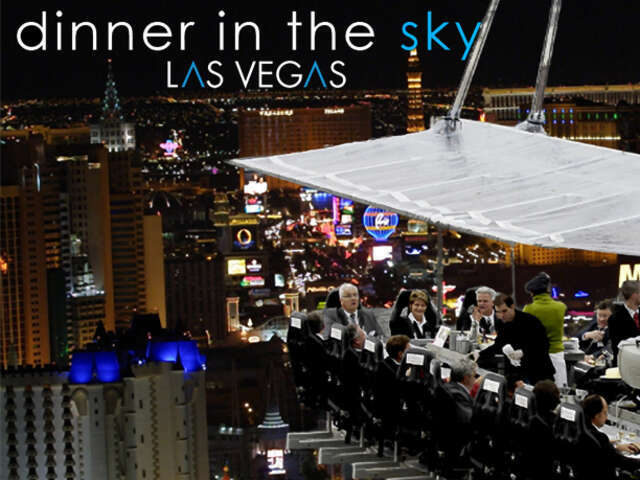 Dinner in the sky is hosted at a table suspended 50 meters high! The table accommodates 22 people with 3 members of staff seated in the middle (chef, waiter, entertainer). A truly unique and unforgettable way to spend an evening in Las Vegas. This experience can be uniquely yours at The Mirage. 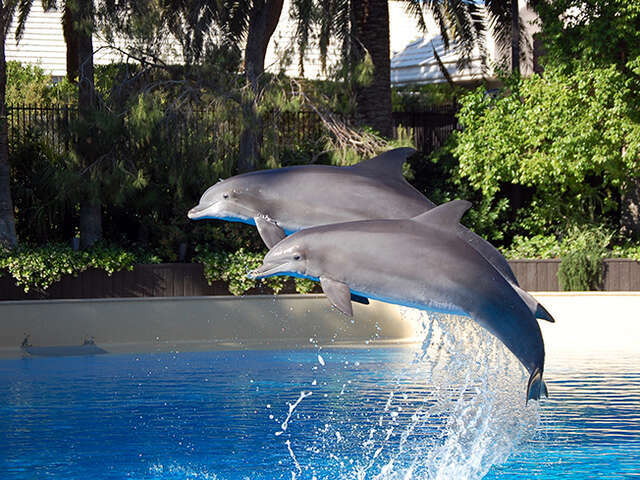 Don a wetsuit and take part in a once in a lifetime experience of working with professional dolphin trainers, both in and out of the water. Shark Reef Aquarium at Mandalay Bay is not your typical aquarium. Comprised of almost 1.6 million gallons of water, the aquarium showcases some of the most dangerous predators in the world. In addition to a Touch Pool Experience, dive certified guests can now scuba dive in the 22 foot deep Shipwreck Exhibit, surrounded by sharks, rays, green sea turtles and schools of fish.